To open this JS Bin in a new window, click here. Many text editors provide special assistance for writing HTML and CSS, like syntax-highlighting and autocompletion. Right-click on a web page and select "Inspect Element"
Open Tools > "Developer Tools"
Unlock the Develop Menu by opening Safari > Preferences > Advanced, and checking the box, "Show Develop menu in menu bar." The document object is globally available in your browser. You can access and change the attributes of a DOM node using dot notation. You can access and change the styles of a DOM nodes via the style property. CSS property names with a "-" must be camelCased and number properties must have a unit. 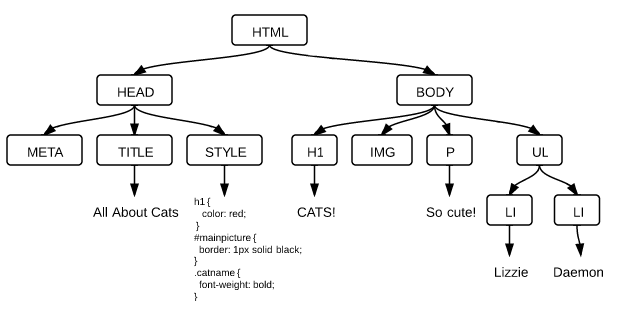 pageNode.innerHTML = "<h1>Oh, no! Everything is gone!</h1>"
If you're only changing the actual text of a node, textContent may be a better choice.